One ERC 17 GUARD can be integrated the ERC 17 chassis rack and supervise all modules plugged in. 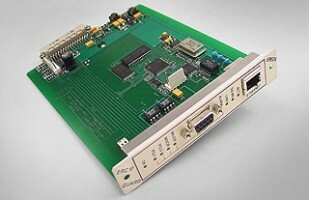 Transmission and power supply modules are automatically detected. Each module of transmission may deliver 3 alarms, one is a major alarm, the second is a minor alarms and the last one is power supply module alarm. Each power supply module delivers significant parameters such as, mains power presence, the level of each voltage created, internal temperature and fan activity. Web browser HTML (W3C compatible), for internet. SNMP agent, as an option.